None of the control measures directly or indirectly affecting wombats -trapping, shooting, poisoning, or all three combined - has had as much impact on wombats or Australia's other native animals as the clearing of the land itself. This process, which began 200 years ago, continues today unabated. Large expanses of forest are still being cleared for crops and grazing, for timber production and pine plantations (Figure 7.7). More forest disappears as towns expand and roads are widened and proliferate throughout the country. In the mountains and hills that comprise most of the wombat's habitat, clearing for grazing creeps higher and higher up the slopes; clear-felling for wood-chipping or timber-harvesting and for the planting of pine trees destroys more and more of the native forests. The number of burrows that remain undamaged after a clear-felling operation, whether for grazing, forestry management or pine-planting, depends mainly on the terrain. Fortunately for the wombat, which often digs its burrows on the banks of creeks and rivers, no clearing can legally be done on the slopes adjacent to stream beds, to reduce the risk of erosion - the prescribed distance varies from 20 to 200 metres, depending on the type of stream and the vegetation - so burrows on these slopes and on others too steep for the bulldozers, will be unscathed. In areas where there are no such inaccessible places, the destruction of burrows will be total. dropped initially during the felling and burning of the native forest, then increased again so that in the three to five year old pine plantations densities were near the levels previously found in the native forest. This increase was due, at least partly, to the regrowth of grasses between the young trees. Fewer wombats were found in older stands of pines, however, where lack of sunlight caused by the closed canopy of the trees, as well as a dense litter of pine needles, had resulted in greatly decreased growth of grasses and other forest floor vegetation. Densities increased again slightly after the first thinning, 15-16 years after planting, but they never reached the densities in the native forests, and just prior to the final felling at 35-40 years, wombat densities in the plantations were dropping again, to about a third of the number in the native forests. In a similar study in 1990, Carol Rishworth recorded much more drastic changes in wombat density. Once again there was a decline in densities in clear-felled areas but numbers recovered in plantations that were more than one year old. In a six year old plantation the numbers were even greater than in the eucalypt forest areas, but then densities plummeted to zero in all of the three 15 year old plantations surveyed. Once the plantations were thinned, however, densities increased again and in 20 and 25 year old plantations they were similar to those in native forest. These changes are probably due to modern thinning techniques and heavier machinery, which open up the canopy to a greater degree, crush the debris more and disturb the soil surface more than the methods and machines used 20 years ago. Although the modern machines disturb the ground to a greater extent and hence could destroy more burrows, they probably also stimulate increased growth of grasses by removing or destroying other ground cover. 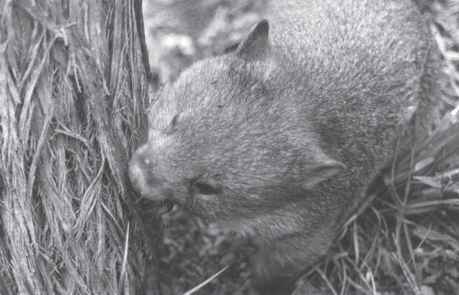 The results of McIlroy's and Rishworth's studies show that although wombats can survive replacement of their native forest by exotic pines, their numbers in the plantations are often low. They also indicate that changes in forestry methods, such as earlier and more frequent thinning, could benefit wombats and other wildlife. The position is initially the same where native forests have been logged or clear-felled for wood-chipping: if enough burrows and food remain, the wombats can maintain a hold on the area. However, usually these logged or clear-felled tracts of land are subjected to 'high-intensity regeneration burning'. These 'slash burns' are carried out in order to remove logging debris, to prepare a receptive seed bed for new regrowth, to ensure the maximum germination of seeds of the eucalypts, and thus to promote the regeneration of the forest for future harvesting. These extremely hot 'controlled' fires destroy all the existing vegetation, and hence all the wombats' food; in any case, wombats are unlikely to live through fires of this intensity. Where land is cleared for crops or grazing, generally all wombat burrows are destroyed - work that has been made easy by the advent of the bulldozer. Some wombats may attempt to re-establish themselves, or at least to enter the cleared land and feed on its usually improved pasture. Here they are likely to come into direct conflict with farmers and graziers, particularly, as has already been discussed, in areas where rabbits are a pest - then out will come the traps and poisons and guns.